In Clocks > Wall Clocks > Show & Tell and Victorian Era > Show & Tell. I recently came into possession of this wall clock and know nothing about it. 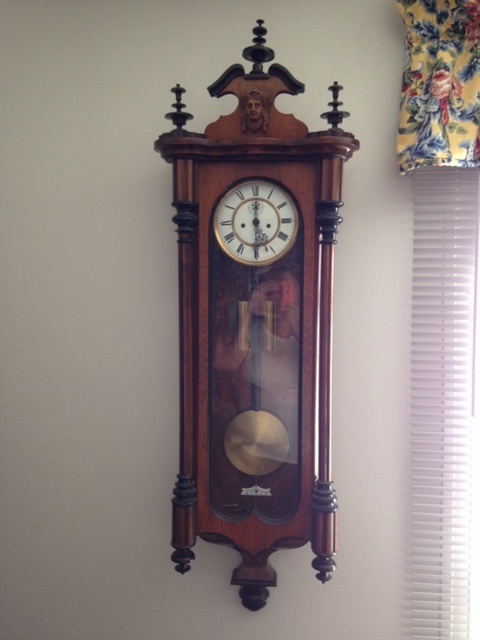 There is no makers name or mark that I can determine, no name on the clock face. Given the construction of the cabinet and style of wood, I assume that it is an original and not a reproduction. There are no staples or obvious sheet board, but everything appears to be original, old wood and the clock movement mechanism is very detailed and complex. If anyone recognizes this clock, information would be appreciated. I've seen many online that are similar, but have not located one exactly like it. You have a fantastic example of a very high quality two weight Vienna regulator wall clock. It was manufactured around 1870-1880, and the maker is German. However, to determine who that maker is one would have to remove the movement, as that is where the trademarks are located, if there are any. A lovely clock! Ticktocktime100! Thanks so much for the insight! Just from looking online, I'd determined a late 1800's Vienna style wall clock, but had no clue as to who or where to locate a makers mark. I can tell you about antique appliances (stoves and refrigerators) all day long, but had not a clue when it came to this wall clock.